What to say first? That Ali’s Wedding is entertaining or that Ali’s Wedding is topical? For Australian audience – especially those who live in Melbourne – it is very entertaining. For Australian audiences everywhere it is very topical. But, what about day-to-day living in Melbourne? The older generation, in this case father and mother, with Don Hany impressive as the father, leader of those who gather at the local mosque (men in one part, women in the other) who pray, discuss, and put on plays. Values from original countries are preserved. Yet, the importance of multicultural interactions in Australia are highlighted. And, of course, this is especially true of the younger generation – Aussie clothes, Aussie accents and Ocker language. 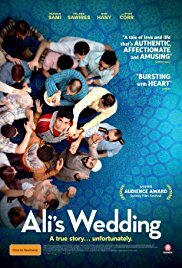 So, some adventures at Melbourne University when Ali attends, despite his mark, and gets tangled in lectures and tutorials – rescued from one by his eager mother and her friends who have wedding plans well in hand. Ali is unwilling. He dreams of Diane. What he gets advice from his friends about how to deal with the tea ceremony and the betrothal, he is so eager that he gets it wrong, everyone initially aghast, but the prospective father-in-law delighted that Ali seems so eager. The wedding of the title, therefore, is that between Ali and his betrothed. 1. A topical Australian comedy? Popular? Civil issues? Race issues? Religious excuse? The Australian audiences? Universal audiences? 2. The film as autobiographical? Osama Sami, his life, writing, acting? The collaboration with Andrew Knight and his reputation? The final photos of all the characters? The tagline: true, unfortunately? 3. The background Iraq, Saddam Hussein, the Baathists and the revolutionaries? The family fleeing to Iran, life in Iran, harshness, leaving? 4. Melbourne, the suburbs, the home, the streets, the mosque, the shops, the fish and chips, the hoardings for Arabic meals? Arab Melbourne? The University of Melbourne, the scenes, the grounds, the rooms? The musical score? 5. The opening, Ali on the tractor, in the wedding suit, the chase, the police, the crash – and the flashbacks? 6. Ali and his mother and father? His heritage? The father and his religious leadership, the customs in the home, dress, the mosque, attitude towards God and providence? The flashback to the boys in Iraq, the older boy standing on the mine, saving his brother? Expectations on Ali? His brother assimilating into Melbourne life and language and jobs, the sister born in Australia, Muslim customs, Australian customs and language? 7. The comment about lies, Ali and his study, studying for the test, sitting for the tests, the attraction towards Dianne, seeing her in the shop? Her father and his expectations? The result of the test? At the mosque, the young man getting 96.2? Ali telling the lie, the better mark? The celebration, his speech about different perspectives, potatoes, pronunciation and differences? The photo on the wall? The mother, everybody celebrating? And the irony that Dianne got 99 and nobody mentioned it? 8. Dianne, her work, the strict attitudes of her father, not going to University? Ali, coming to the shop, explaining the need for doctors, for Dianne’s father and his arthritis, his giving permission? 9. At the University, the three going to the lectures, the lectures, tutorials, Ali and his ignorance, Dianne coaching him, pressurising him to learn? The tutorial, interrupted with his mother and the suit? 10. The parents taking Ali to visit the other family, Ali ringing to the garage for advice, about the drinking of the tea, to avoid betrothal? His drinking the tea, the father’s enthusiasm, betrothed, the girl and her being attractive, the family and their characters? 11. The play, the musical, the women separated from the men, the men drinking coffee, the women chatting? His father and his writing plays? The new play, Ali as Saddam Hussein, the songs, the rehearsals, the satire? 12. Ali and his friends, growing up, the Muslims, the ordinary Australian and his comments? The friend worked in the garage? 13. Ali, the exposure, the proud father, his religious stance, with his son? Ali and his admitting the truth? The effect on his father, on his mother, on the community? On his fiancee’s family? 14. The community dealing with Ali, the gathering, the taking down his picture, yet the support of him as a person? His father standing down as religious leader in the mosque, the serious father taking over, sitting on the high chair? The community rebelling and reinstating the father? The other man going off in a huff after denouncing the community? 15. Dianne, her relationship with Ali, in love, the outings, sunsets…? Ali and his talking to his father, listening to his father solving all the cases, casuistry, interpretation of the law? The issue of the personal wedding, the commitment for six weeks, the commitment on the railway station, the two witnesses on the train coming? The background of Islamic divorce and the husband’s declaration, three times? In the casuistry of saying it many times but only the one thought? 16. Dianne humiliated, her father’s reaction, out of the University, going to Lebanon? 17. Dianne, her denunciation of Ali? His being hurt? Out of studies, back to the shop? His plan, going to the airport every night, to meet the flights from Lebanon? The many disappointments? 18. The final visit, her arrival, being reunited? 19. The true story, the photos of the various characters and the story of what happened?